Renault's team principal Flavio Briatore is looking forward to the start of the season. He believes that Renault should be able to once again adapt well to regulation changes and benefit from that, just like in the past. During 2008 Renault produced a tremendous fight back. What was your verdict on last season? I’m proud of the work that the team accomplished in 2008. We had a difficult start to the season, but nobody gave up – quite the opposite in fact! At both the factories in Viry and Enstone, everybody worked incredibly hard to improve the car and get us back to the front. The victories in Singapore and Fuji were a credit to the whole team and have been of vital importance for our preparations for 2009. We have shown that we are truly a top team – capable of winning again – and that gives us genuine hope for the year ahead. We have paid great attention to the new regulations and started our preparations for the R29 project quite early. Having confirmed our competitiveness last year, the team is even more determined to get back to winning ways in 2009. There are lots of new things to deal with and that could shake things up, but Renault has shown that it is a top team and we certainly intend to continue fighting at the front. We will now concentrate 100% on our final preparations for the start of the season so that we can arrive in Australia ready to fight for the podium. What have been the main challenges during the winter? Once the 2009 regulations were confirmed, we had to finalise our R29 programme to make sure the chassis was ready for the first test in January. Whether it has been the new aerodynamic regulations or the changes to the engine, this project has required a great deal of work by our engineering teams in Enstone and Viry. Dealing with these changes have been the main technical challenges to overcome this winter. for 2009. What are the main strengths of this partnership? It’s important to have some stability, especially when the environment around you is changing. Fernando and Nelson know each other; they worked well together last year and they feel comfortable in the team. They also know that we are doing all we can to give them a competitive package this season. Fernando is without doubt the best driver on the grid - he proved that again last year and we are delighted to continue our collaboration with him, which is a real boost for the team. Nelson has learnt an enormous amount and matured during his rookie season; we want to give him the chance to confirm the faith we have in him. Looking ahead to the season I am convinced that we have a particularly competitive driver line-up. 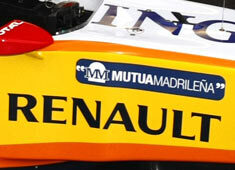 The 2009 season sees new rules on the technical and sporting fronts - is Renault in a position to take advantage of this? Renault has often benefited from regulation changes, distinguishing itself by its choices to gain an advantage over its competitors. This year the playing field will be very competitive and we will soon know if the technical decisions we’ve made will turn out to be the right ones. But we’re not relaxing our efforts and with the start of the season just a couple of months away, we’re concentrating fully on our development programme to try and find those vital hundredths and tenths of a second which make the difference. So we’re approaching the 2009 season hopeful of having the strongest package, but well aware of the challenges that lie ahead. It’s never easy to make predictions at this stage of the year. We know where we are in our development programme and we also have the feedback from the drivers and engineers, but I don’t want to risk making any predictions, especially this season with so many new rules. We can probably expect some surprises, which will be interesting for the fans. Where will Renault be on the grid next season? I hope at the front! We are doing everything to make that happen. Whether it’s our drivers or the staff in Enstone and Viry, I know that everybody will give their maximum to improve our competitiveness. Will the team be able to fight at the front? Renault won double world titles in 2005 and 2006 and after a tricky season in 2007 fought back strongly last year. We have therefore shown that we are a top team and capable of bouncing back. As I’ve said, we will do everything to confirm that again this year to show that we can manage change. With the economic climate of the world as it is, must F1 change the way it operates? All the constructors have agreed to reduce the operating costs of the teams and ensure the future of the sport. This tricky refereeing is sometimes necessary but is aimed at producing a better spectacle for the supporters who follow Formula 1 in the long term. Just like numerous other enterprises, the teams and constructors must review their operating methods and their economic model. In the current climate, it would have been impossible to do otherwise. commercial group of FOTA, are you happy with the direction the sport is moving in? There are various different proposals with the aim of making Formula 1 races more exciting, but they are still in the course of negotiation. Lots of things are being discussed such as a new qualifying or a testing format on Fridays which could make things more interesting or even a system of medals, as we see in many other sports, whereby the champion is the driver who wins the most races. We must provide a spectacle of the highest quality to the fans and hope to get more people interested. After all, the survival of Formula 1 is at stake.